* Ultrasonic radiation gets rid of rodents, insects and many other pests. 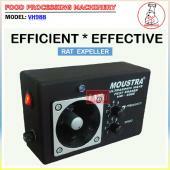 * Ultrasonic pest controlling system with multi-frequency modulated sounds. * Doesn’t kill rodents and insects – It drives them out! * No toxic chemicals or messy traps, SAFE and CLEAN. * Harmless to humans and most household pets. 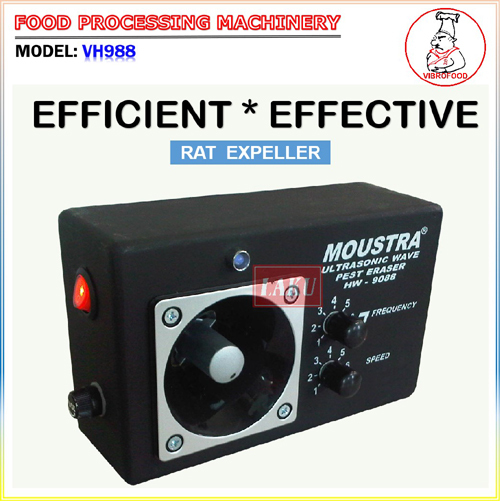 The only high-powered Ultrasonic Rat Expeller with special “Multiplex Modulated Sweeping Ultrasonic Sounds” designed and manufactured by us. These high intensity Ultrasonic sound waves (20~65 KHz) are out of the range of hearing of humans are most household pets, but pests. These nerve-crushing sounds (to rodents and insects) directly pent rate their brain and nervous systems causing them severe pain and discomfort, and make them uneasy in the voluntary repulsion against Ultrasonic wave areas and pests are impossible to stay at such radiated areas. 1. This device automatically changes the frequency 1~60 times a second, assuring complete coverage of all the communication frequencies of rodents insects and many other pests, and make them not get used to the Ultrasonic waves. 2. It eliminates pests by using electronic method which is more sanitary and economical than chemical poison method. 3. These remarkable units will not interfere with any electronic burglar alarms, fire or smoke detectors, radio, TV reception or other electronic equipments. 4. It emitted the modulated frequencies which sweep automatically from 20 KHz to 65 KHz that repulses pests. 5. Obvious effects appear within 2 to 4 weeks after the installation, then continual use the Rat Expeller will prevent further nesting and inhabitation.